A key question is whether these cells can be modulated under inflammatory conditions towards a tissue-protective phenotype.6 Modulation of MAIT cells might be a more interesting therapeutic approach than modulation of their phenotypical and functional counterparts, the iNKT cells. MAIT cell numbers are relatively high in humans (1–10% of circulating T cells, 20–45% of T cells in the liver and 3–5% of lymphoid cells in the intestinal mucosa), compared with numbers of iNKT cells. The opposite situation is present in mice, where iNKT cells are rather abundant compared with MAIT cells, the latter also not displaying a functionally mature phenotype as can be found in humans.7 This bias might suggest an evolutionary need for one or the other cell type.11 In many inflammatory diseases, systemic MAIT cell numbers are lowered compared with healthy controls, with a relative enrichment in the inflamed tissues.4 ,7 A similar situation was found in patients with AS and patients with RA, where MAIT cells were enriched in the synovial fluid and lowered systemically. Even though the numbers between AS and RA seem comparable, they phenotypically differ as only in patients with AS MAIT cells had a predominant IL-17A profile.10 Human MAIT cells are often characterised as CD3+ TCRVα7.2+ CD161hi T cells.4 ,12 The use of this marker panel is, however, not without any risks, especially when used to characterise MAIT cells in patients suffering from inflammatory diseases. Upon activation, MAIT cells downregulate CD161 and the expression of this marker can be confounded by the use of corticosteroids.4 In axial SpA and, to a lesser extent, peripheral SpA, corticosteroids are not the therapy of choice13 and decreases in MAIT cell frequencies due to corticosteroid use are not to be expected.14 The results described by Gracey et al10 come from a cross-sectional observational cohort, providing very useful insight into MAIT cell functionality in AS. However, the patients have been exposed to a wide variety of treatment strategies, possibly influencing data outcome. It would thus be interesting to see if similar results could be obtained in patients with new-onset, therapy-naïve SpA. What makes MAIT cells an even more appealing cell type in the light of combined gut–joint disease, is that they typically reside in the epithelium and lamina propria of the gut, a site of important host–microbial interplay.15 Here, they fully mature after thymic emigration, a process that depends on the presence of the commensal microbial flora and B cells.16 A hallmark of these cells is their highly restricted TCR Vα repertoire.7 They react to non-peptide antigens, bound by the non-classical class I antigen-presenting molecule, MR1 that is highly conserved across mammalian species (figure 1). MR1 presents vitamin B2 metabolites, which are specific to certain species of the microbiota such as Salmonella enterica serovar Typhimurium, to MAIT cells.7 ,12 However, the exact set of antigens recognised by MAIT cells is not yet fully known and it is possible that MAIT cell TCR usage differs between individuals.7 Given the antigen restriction that is typical for MAIT cells due to the expression of a semi-invariant TCR, their typical effector memory phenotype—allowing rapid production of large amounts of cytokines without prior clonal expansion—and their presence in the gut lining, they may function as first responders towards aberrant microbial signals but may also sustain abnormal inflammatory reactions. Genetic factors underlying the, however limited, divergence in TCR usage towards gut-derived antigens might partly form the basis towards aberrant immune reactions due to TCR signalling as seen in autoinflammatory diseases such as SpA (figure 1). However, Gracey et al10 showed that TCR-activated reaction in patients with AS was not different than that in healthy controls. 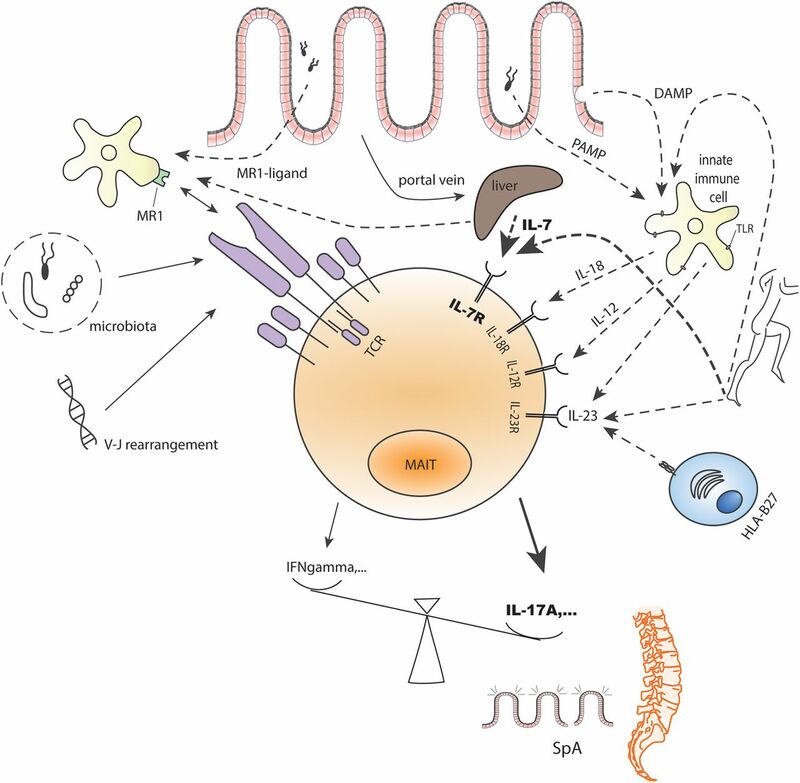 Conceptual framework of the role of mucosal-associated invariant T (MAIT) cells in spondyloarthritis (SpA)—MAIT cells express a semi-invariant T cell receptor (TCR), as well as high levels of interleukin (IL)-7R, IL-18R, IL-12R and IL-23R. They can be activated in a TCR-dependent and TCR-independent manner. TCR-dependent activation is via antigen recognition of vitamin B derivatives, by-products from the microbiome, that are presented via the non-classical class I antigen-presenting molecule MR1. These antigens can be picked up directly at the mucosal border or can be transported via the portal vein to the liver, where many MAIT cells can be found. TCR rearrangement is determined by genetic factors and will influence antigen recognition by MAIT cells. Furthermore, maturation of MAIT cells depends on the presence of commensal microbial flora and thus likely TCR signalling. TCR-independent activation of MAIT cells is cytokine induced, directly or after activation of innate immune cells via their toll-like receptors (TLRs). These TLRs can bind both pathogen-associated molecular patterns (PAMPs) from the gut as well as danger-associated molecular patterns (DAMPs) released upon cellular stress (epithelial damage, biomechanical stress, human leucocyte antigen (HLA)-B27 misfolding resulting in unfolded protein response). Furthermore, TLR signalling in the liver as well as stress in synovial fibroblasts can lead to IL-7 production, which solely or in combination with anti-CD3/CD28 can lead to MAIT cell activation. All these signals eventually result in the activation of MAIT cells and consequent production of pro-inflammatory cytokines, such as interferon-gamma (IFNγ) and IL-17A. The equilibrium between these cytokines is invaluable in the pathogenesis of SpA, tipping the balance towards resolution of inflammation or full-blown chronic disease (gut inflammation and ankylosis of the spine), the latter is hypothesised to happen under high IL-17A levels. The results of the paper by Gracey et al10 thus shed new light on the involvement of MAIT cells in SpA, more specifically AS. Food for thought is the finding that TCR-independent mechanisms may be more important in shaping MAIT cells than TCR-dependent mechanisms. In this paper, we may assume that their role in disease initiation and perpetuation will more likely depend on their capacity to rapidly produce T cell-related cytokines in an inflammatory setting, where the ruling cytokine environment will direct MAIT cell functionality. However, their TCR dependency in AS may depend on the nature of the antigen encountered and studies involving the fully known spectrum of MR1 ligands will thus be indispensable to answer this question. Furthermore, since MAIT cells depend on the microbial flora for their maturation, TCR signalling might also play a role early on in life during this maturation process. All in all, MAIT cells are not just another brick in the wall and future research into this cell population will give new insight into the pathogenesis of SpA.
. The evolution of spondyloarthropathies in relation to gut histology. II. Histological aspects. J Rheumatol 1995;22:2273–8. Funding Collaborative research of the authors (RJL and DE) on the topic is supported by grant G.0946.14 from the Research Foundation—Flanders (FWO) and by the DevRepair (P7/07) IUAP-VII Network (Belgian Federal Government). DE is supported by a fund of Research Foundation—Flanders (FWO) and the Research Council of Ghent University. DE is also a member of a multidisciplinary research platform (MRP) of Ghent University. DE received funding from the EU's seventh framework programme under EC-GA no. 305266 ‘MIAMI’. KD is supported by a grant of Research Foundation—Flanders (FWO) (FWO15/ASP/051).